What do you cook for Easter Dinner? Do you have family favorite recipes? 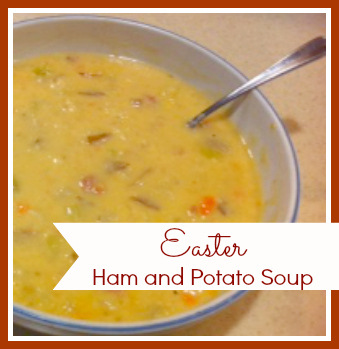 If you cook Ham, use the leftovers to cook this tasty ham and potato soup recipe. There's nothing better than a bowl of piping hot soup on a cold winter day. Well, okay, a trip to Hawaii might be a bit nicer. But there's no doubt that steaming soup is a close second! At my house, this soup is always a hit (with almost everyone, that is. I have five kids and the chances of making everyone happy at one meal are slimmer than winning the lottery!). I hope you and your family enjoy it as much as we do! - Recipe provided by Guest Chef, mammamillk. Saute the first 5 ingredients in the butter on medium heat for about 5-6 minutes. Add the flour and stir to coat. Slowly drizzle in the chicken broth and water. Cook for 15 minutes on medium high. Add salt if needed. Add the potatoes and cook an additional 15 minutes more. Add the cayenne and black pepper. When you're ready to eat, add the cream. The soup is ready when the cream is warm. If you'd like to add cheese, remove the soup from the heat and add a bit, stirring to melt it. Find out more about mammamillk on her blog at www.mammamilk.blogspot.com.